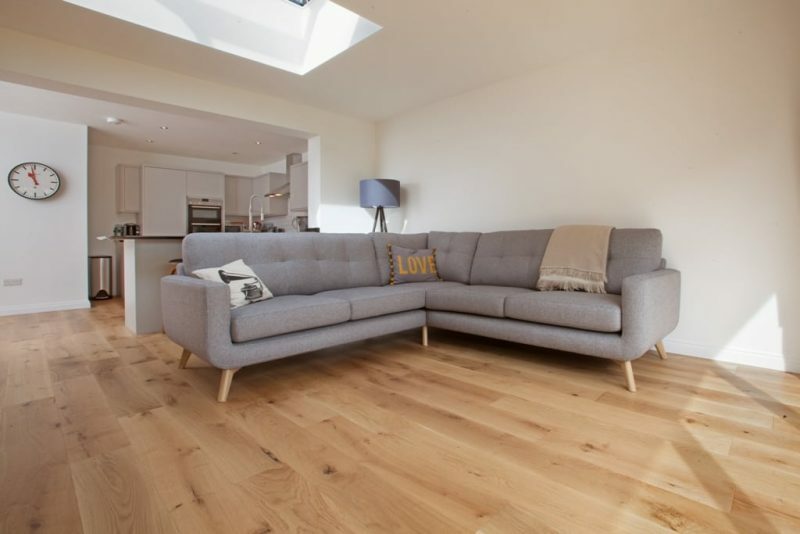 This 3 bedroom semi detached home in Hitchin, Hertfordshire finally has the makeover its’ owners dreamt of with the completion of a new open plan extension. 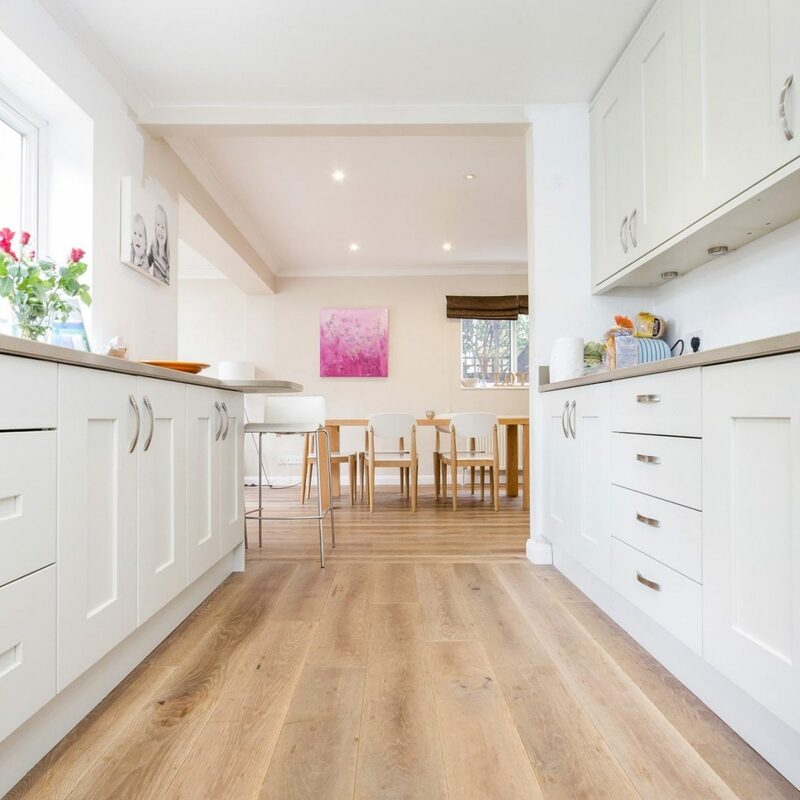 Originally built in the 1980’s, the home still featured the original kitchen and dated vinyl floors installed when it was first completed, and new owners Mr & Mrs Layt were ready to bring the home up to date with a new contemporary open plan extension. 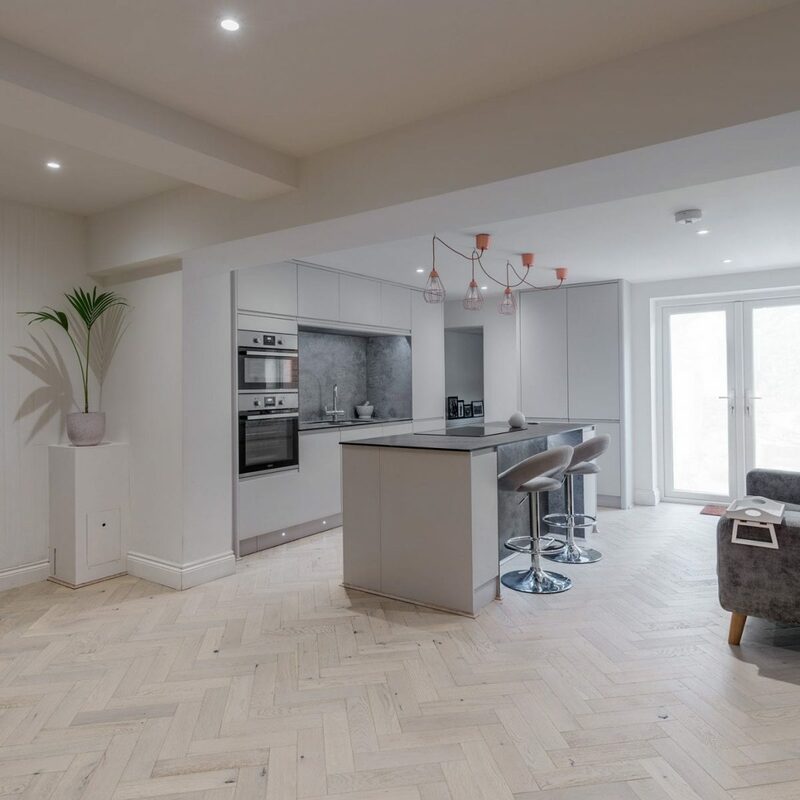 The original home featured a living space to the front, which led to a separate dining room and small kitchen at the back, and they were keen to reconfigure and extend the rear of the home to create a more modern open plan space and install a contemporary kitchen design. Working with local builder Alan Wyatts from ABL Building and Plumbing, a family company comprising Alan and his two sons, and Pentangle Design, a local architects firm based in Hitchin, the team created a proposed design that included knocking through the existing rear kitchen and dining room and adding an extension to the back of the home so a stunning light and spacious open plan area could be created. 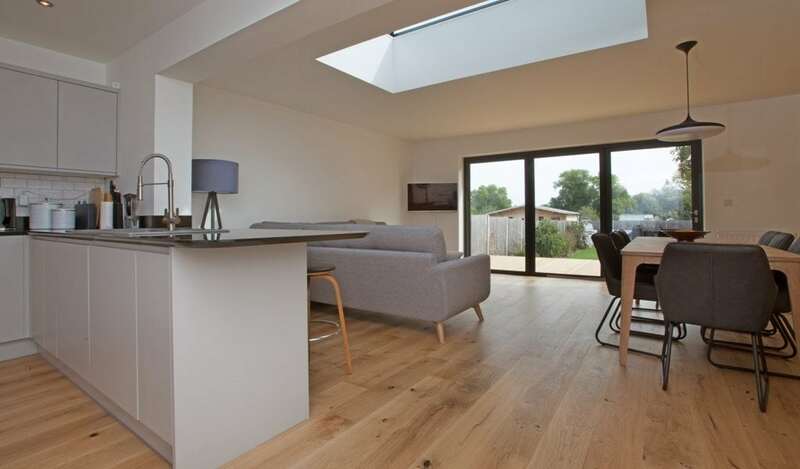 The finished space has certainly delivered modern open plan living, flooded with natural light from the skylight and bi-fold doors which open out to a large 80ft garden. 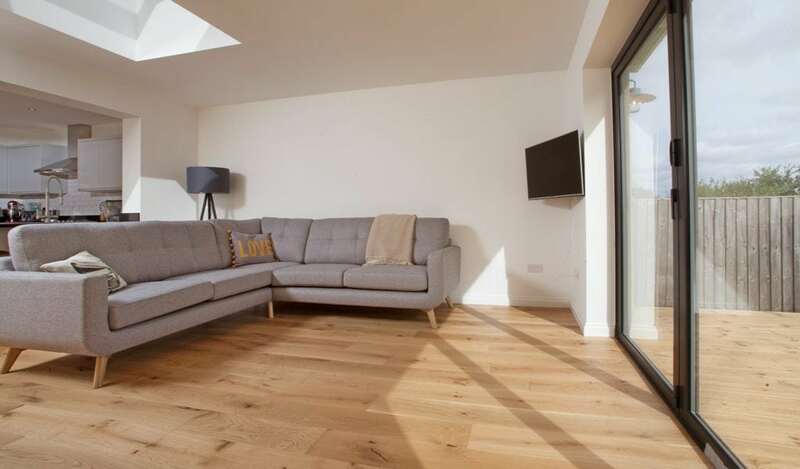 The owners, builders and architects all collaborated on the interior finishes to create a design that would maintain a natural minimalist feel and promote a feeling of space. 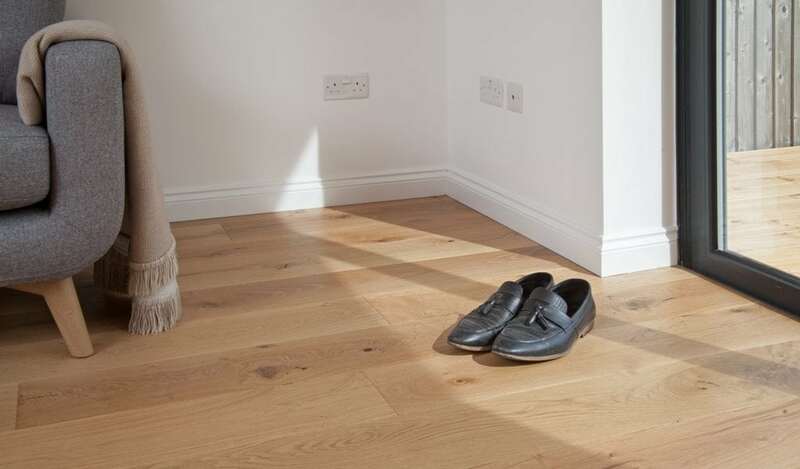 Alan had installed V4 Wood Flooring in previous projects, and always impressed with the quality, finish and ease of installation showed the couple a selection of V4 samples. 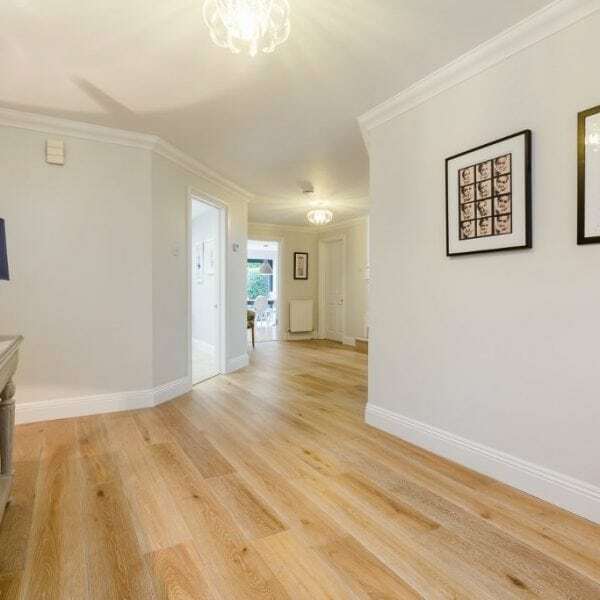 Keen to maintain a natural finish to the space Alpine Oak Rustic Brushed and Lacquered wood floors were selected. 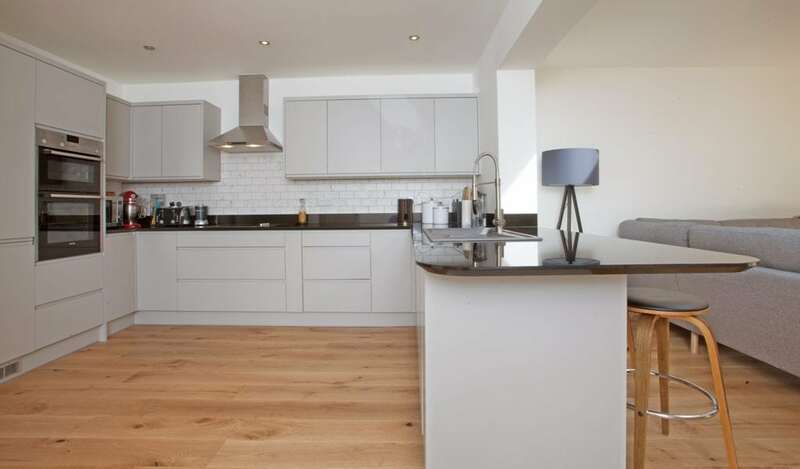 These natural looking oak boards are treated with a series of steel brushes to remove the soft grain from the top layer of rustic oak, whilst sympathetically following the natural contours of the wide section of oak to maintain smooth knots and character. The surface is then spray coated with 6 coats of durable aluminium oded matt lacquer. 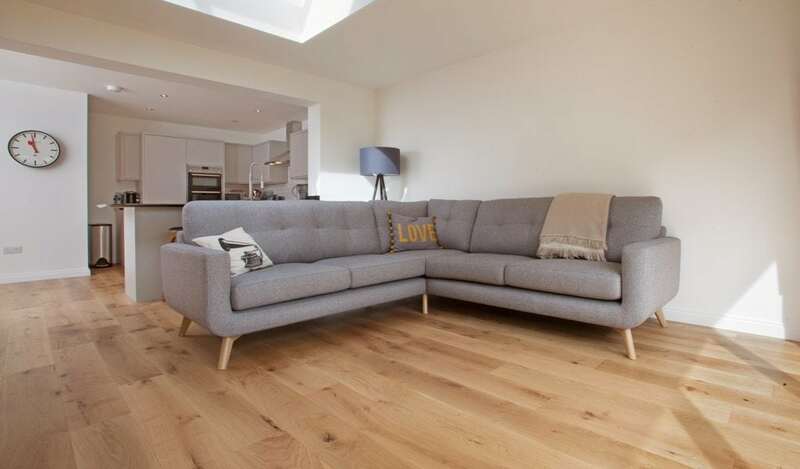 The resulting plank is natural and tactile, but also hardwearing, deflecting everyday wear and scratches and making them an ideal flooring choice for living and kitchen areas. 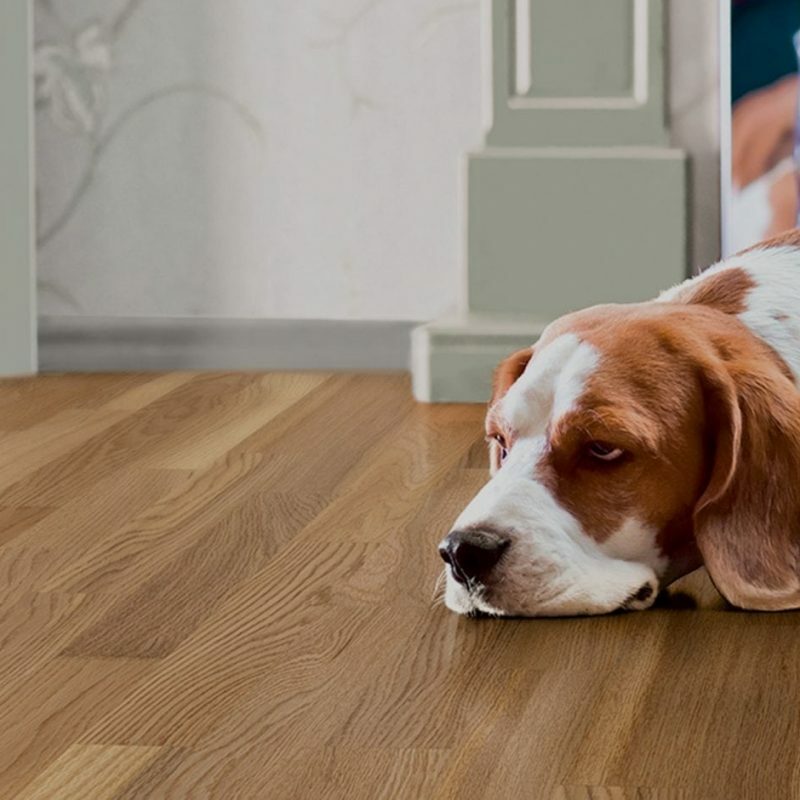 Alan sourced the chosen wood floors from nearby V4 approved retailer, Hertfordshire Timber Supplies. 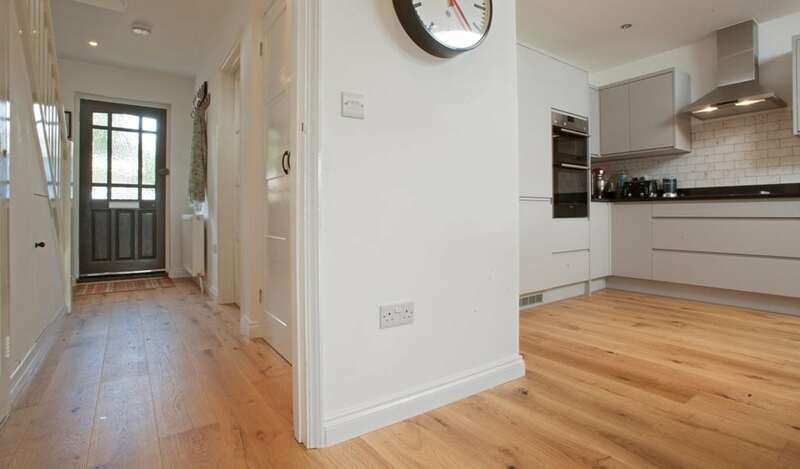 The floors were prepared with a fresh screed to even out the old timber sub-floor with the new extension area and the Alpine wood floors were installed in a matter of days. 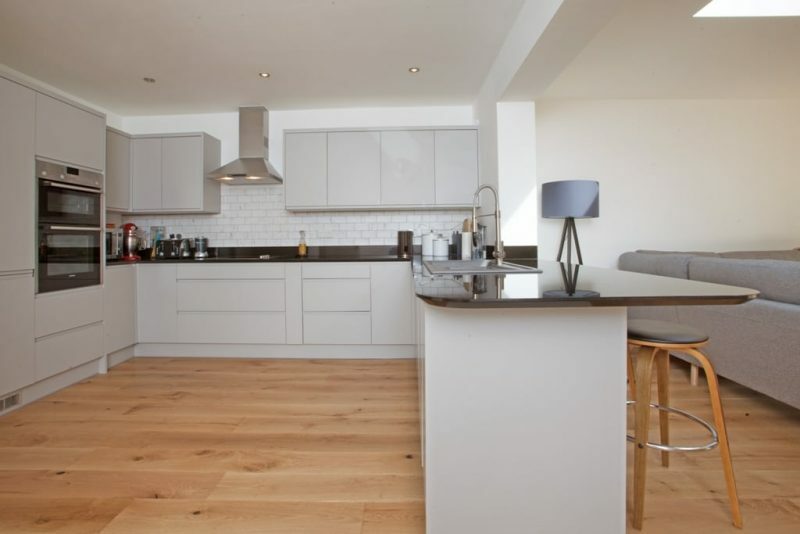 The whole project took a total of ten weeks, and everyone involved is delighted with the results. 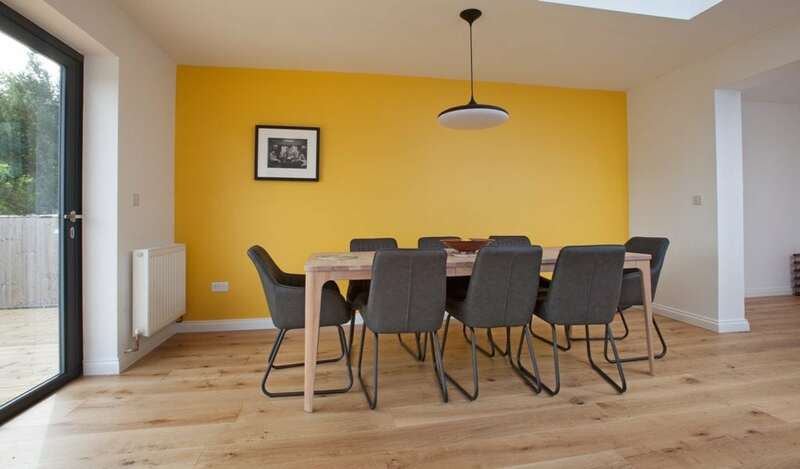 The tired 1980’s home now has a modern and functional space to cook, eat and socialise. 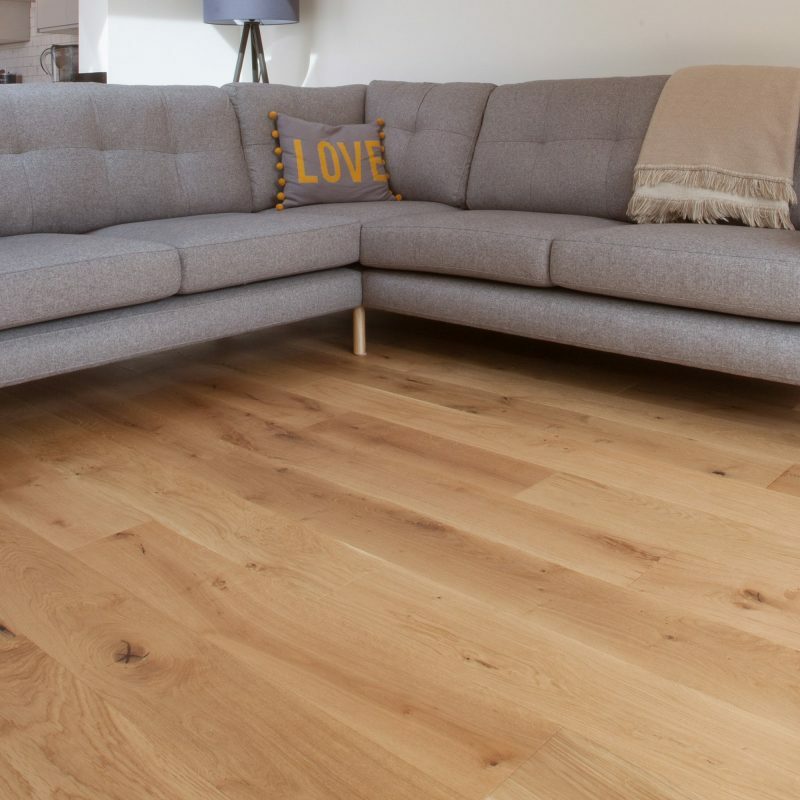 The floors give a beautiful natural light oak finish which promotes a feeling of space and works effortlessly with the modern interior décor selected. 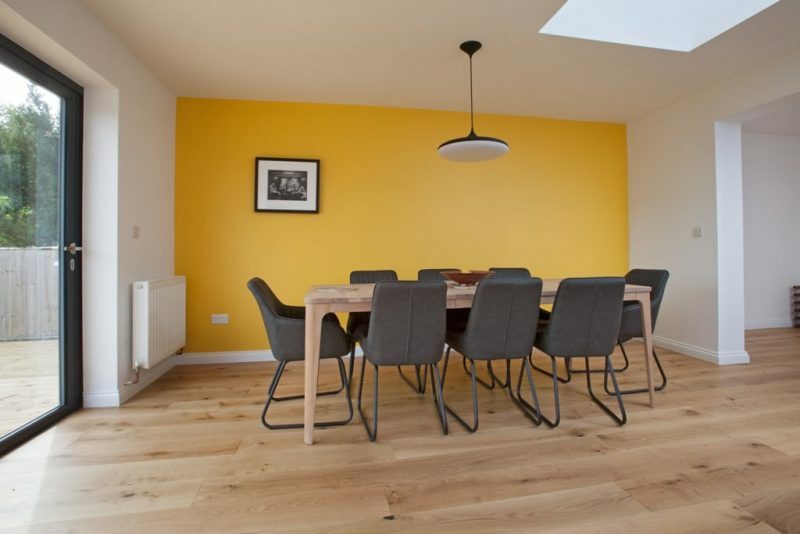 Colour is added with a striking yellow feature wall to the dining area, delivering a Scandinavian feel to the finished design.